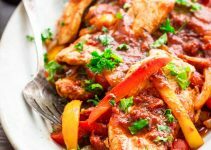 Healthy, low-carb spiralized sweet potato and chicken is spicy and flavorful made with fresh tomatoes, onions and jalapenos. 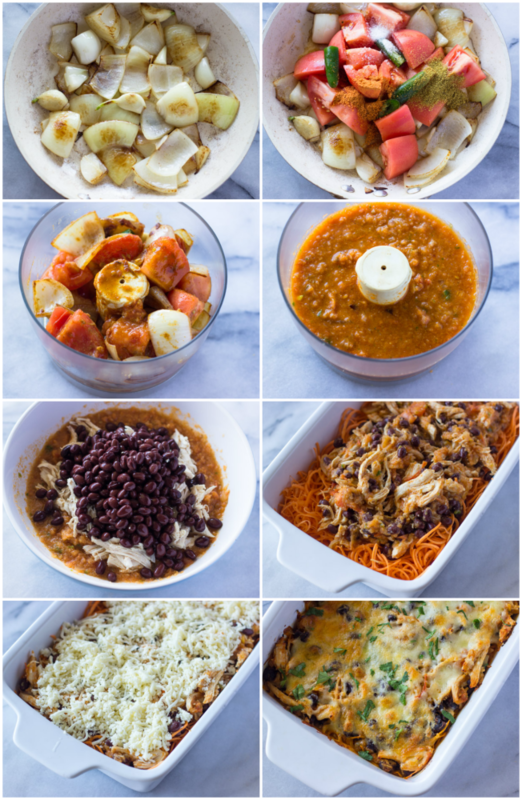 Yay to low-carb healthy weight-loss meals! I recently purchased a vegetable Spiralizerfrom amazon and have had so much spiralizing just about everything in sight. I’ve used it for potatoes, apples, zucchini, carrots, peppers and even cabbage. I’ve also made a few low-carb meals with it and all I can say is how much I am in love with it ???? Just a small warning to you all… I’ll be using it a lot more in the near future, so expect to see like one billion spiralized recipes on the blog in 2016! okay maybe I’ve over exaggerating but I hope that I’ll keep using it to incorporating healthy veggies in our meals ???? Also, If you scroll down you will notice there is a nutrition label after the recipe. This is my first post with a nutrition label and I plan to add the nutrition to more of the recipes. 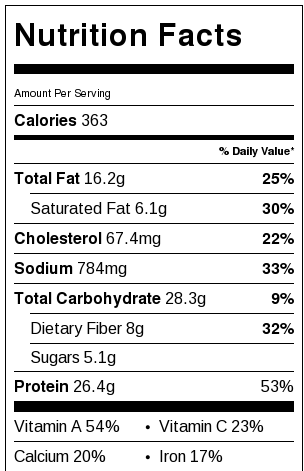 It shows the calories, carbs, fat, sodium, and cholesterol per serving. As you can see below this delicious sweet potato casserole is only 383 calories and 28 grams of carbs per serving! 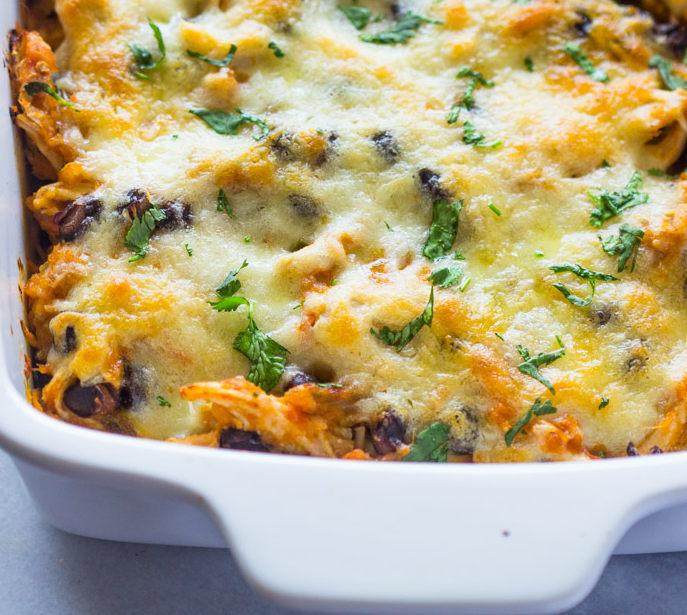 A healthy Low-Carb casserole made with spiralized sweet potatoes and shredded chicken breasts. Add corn or diced veggies to make this dish even more healthier and colorful. Spiralize sweet potatoes with the smallest noodle blade using your spiralizer ( this can also be done with a cheese grater); place sweet potatoes in a 9×13 casserole dish. 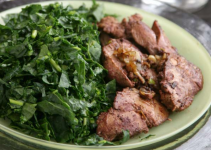 This would also be a good time to prepare shredded chicken breast to cook if you don’t already have cooked chicken on hand. Cook Spicy Salsa: Heat a medium heavy-duty pan to high heat. Add oil, onions and whole garlic. Cook for 2-3 minutes or until the onions are charred. Add tomatoes, jalapeno, and spices. Cook for another 2-3 minutes or until the tomatoes are soft. Transfer mixture to a blender (do not use food processor like I did) or use an immersion blender. Blend the mixture until it’s chunky. Assemble: In a large bowl combine the salsa, shredded chicken, and black beans. Mix until fully combined. 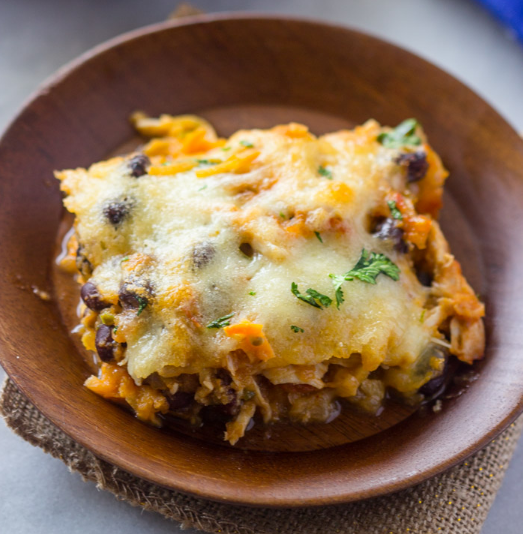 Pour mixture on the spiralized sweet potatoes and top with shredded cheese. Bake: bake for 35-40 minutes or until the cheese if fully melted and the sweet potato is soft to the touch. Serve Warm. Enjoy! 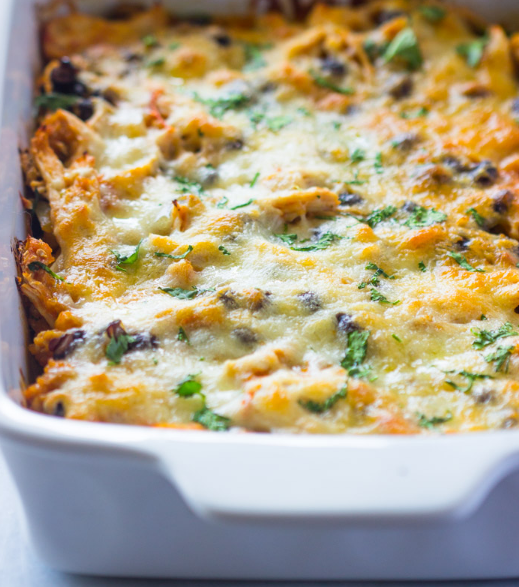 Nutrition FactsTex-Mex Spiralized Sweet Potato & Chicken Casserole (Healthy, Low-Carb)Amount Per ServingCalories 383* Percent Daily Values are based on a 2000 calorie diet.